Following the ice carnival which took place on 19th November 1909 at the Raploch skating pond, the roller skating rink took up the idea of a carnival with fancy dress arranging the first one for Wednesday December 15th from 7pm to 11pm. Special tram cars were arranged for Bridge of Allan and St Ninians and special late trains for as far away as Perth, Callander, Falkirk and Alloa in anticipation of a large crowd. Unlike the ice carnival where arrangements have to be made very quickly when the pond froze, there was plenty of time for everyone to prepare their costumes as it was advertised well in advance. Other entertainments were also advertised including a hockey match and obstacle races and musical chairs, with the adverts emphasising that spectators would have much to amuse them over the night. For this carnival, extra staff were brought in from the company’s Perth rink and they took part in some of the events. Besides ordinary rink skating and the advertised events, there was an egg and spoon race for ladies, a balaclava melee for gentlemen and an exhibition of figure skating from the chief floormaster at the rink. There was a grand parade of all the people in fancy dress with masks. They were judged and winners announced and then all the participants removed their masks. There were estimated to be some 200 skaters there. 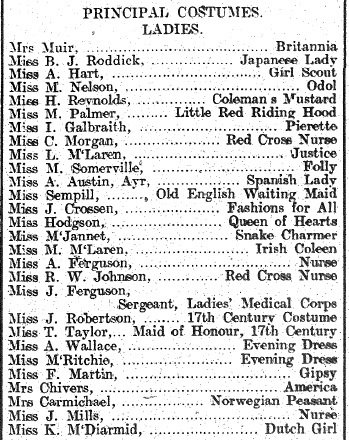 55 ladies and 68 gentlemen were listed in the Stirling Observer as participating in fancy dress along with details of their costumes. Other carnivals in the surrounding area which took place after the Stirling one were not so successful, Bannockburn had only five fancy dress participants and Alloa had only 16 skaters turn up. The Grangemouth one was well supported, but the competitions had to be curtailed due to a want of entrants. Different varieties of fancy dress carnivals were arranged over the season, but numbers in fancy dress and number of skaters generally slowly declined over time despite prices being reduced by half (exceptions being the charity carnivals, e.g. in aid of Stirling Royal Infirmary). The Moonlight Carnival for example had two arc lamps installed by Henderson Bros. and the dress code was to be white only. The lamps were played over the skaters like search lights picking up the white clothes in the darkened rink. It was not repeated. Prizes were also advertised and put on display inside the rink in an effort to encourage more people to dress up, but it could not stop the decline. It must have been difficult to judge the costumes and a variety of categories were used for awarding prizes. In 1911 the spectators were being entertained by other events such as wrestling run alongside the carnivals and spectators greatly outnumbered the skaters. The graceful skating competition was judged by the spectators who were handed voting cards when they entered the building. These were collected at 10 o’clock. The winners by a majority of 25 votes were Miss A. Wallace and Mr R. McGibbon, the prizes being a lady’s dressing case and a gent’s Gladstone bag. In summary, the carnivals became less about skaters dressing up to keep the spectators entertained, and more about planned entertainment for spectators and skaters who turned out in number when admission charges were kept reasonable. Many more people participated when charity events were held and large sums were raised for good causes. Shepherdess, Miss Nisbet, Barnton Street, Stirling. North Pole, Mr R Kilpatrick, Woodlea, Bridge of Allan. Mary Queen of Scots, Miss V Reyburn, Clydesdale Bank House. Irish Woman, Mr A Forbes, Abercromby Place, Stirling. Curate (who doesn’t like London), Mr N Craig, Mar House. Winners of Silver Cup, Perth by 2 goals to 1.